During the winter months, many people plan vacations to Yosemite National Park to go skiing at Badger Pass. With winter’s chill in the air, people’s minds often linger on thoughts of fresh snow and the beautiful scenery that Yosemite’s Badger Pass is well-known for. When it comes to Yosemite skiing, the most talked about slopes are located in the Badger Pass ski area. The Badger Pass ski area is quite infamous and is centrally located in Yosemite National Park. These slopes are great for beginners who want to try skiing for the first time and also offer excitement to people who are a bit more advanced. Additionally, the white hills in Badger Pass are perfect for families or for people who want to try Yosemite cross country skiing. Unlike skiing in larger areas, Badger Pass skiing is unique because people are treated to majestic views while enjoying an activity they love in an intimate setting. People can partake in both downhill skiing and Yosemite cross country skiing when they visit Badger Pass. The Badger Pass ski area has 5 downhill ski lifts with elevations that reach 8,000 feet. This vast area is approximately 90 acres and has 10 exhilarating runs. If downhill skiing isn’t quite your thing, you may want to try cross country skiing, which will allow you to take in glorious views of Yosemite at a more relaxed pace. While visiting Badger Pass, people can also snow board, snow tube or even go sledding. If you’re new to skiing, but are looking to become acquainted with this fun-filled sport, there are schools like the Badger Pass Cross-Country Center & Ski School that offer classes. This school opened in 1970 and offers lessons for people of all levels, from beginners to advanced skiers. Yosemite's Scenic Wonders is the closest accommodations to Badger Pass Ski Resort, just a scenic 15 minute drive to the lifts! You won't find long lift lines here! and hiking snow-dusted trails in Yosemite National Park is an experience you just won't find else-where. When you're ready to come home from a full day of skiing or adventuring, you'll be in the most comfortable lodging near Yosemite for hundreds of miles! Badger Pass, established in 1935, is California's oldest operating ski area, and is celebrating its 60th anniversary. California's first choice for family skiing, has earned a well deserved reputation as one of the west's best places to learn or improve your skiing. Badger Pass offers downhill skiing with five lifts and nine runs suited to skiers of all abilities, in addition there are three main areas for cross-country skiing and snowshoeing: Badger Pass, Crane Flat, and the Mariposa Grove. 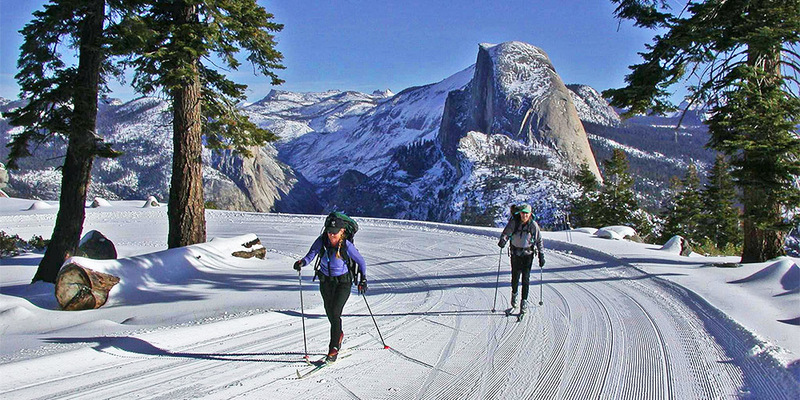 Yosemite claims some of the worlds finest Cross-Country skiing, with 350 miles of skiable trails and roads. Most cross-country skiing in the National Park occurs at Badger Pass on the 90 miles of marked trails, which begin from the ski area. 35 km (23 miles) of machine groomed track and skating lanes travel from Badger Pass to Glacier Point and to the Clark Range Vista. Numerous other trails lead to such scenic destinations as: Dewey Point, Washburn point and Ostrander Lake. Instruction and rentals are available at the Yosemite Cross-Country School adjacent to the Badger Pass Day Lodge. Ski trail maps and topograghic maps can be purchased at park visitor centers. For cross-country ski school information, call (209) 372-1244. For downhill ski school and conditions, call (209-372-1000. Ice Skate on one of the few outdoor rinks in the western United States. It's at Curry Village with a spectacular view of Half Dome. What could be more enjoyable on a starry night than gliding beneath the lights over the ice or cuddling beside the firepit as you watch the skaters go by? Open seven days a week you will enjoy their warming hut, skate rentals, hot drinks and snacks!